Objective statement: This should be two to three sentences that describe what you are looking for in a position. You can include some keywords here relevant to the job you are applying for. It serves as a “teaser” and is intended to make a prospective employer look more closely at your resume. Formal qualifications and certifications: Provide the school name, date graduated, and degree received for any degrees you have. Nurse Managers will usually have at least a Bachelors of Science in Nursing. Many will also have a Master’s of Science in Nursing Administration. Provide the details of your nursing license including the state/states you are licensed in and the date that your license became valid. Any other certifications you have earned that are relevant should be included as well. Employment history: List all previous nursing employment beginning with the most recent, and a summary of what your duties were in each job. A registered nurse resume sample can be useful when writing the resume. 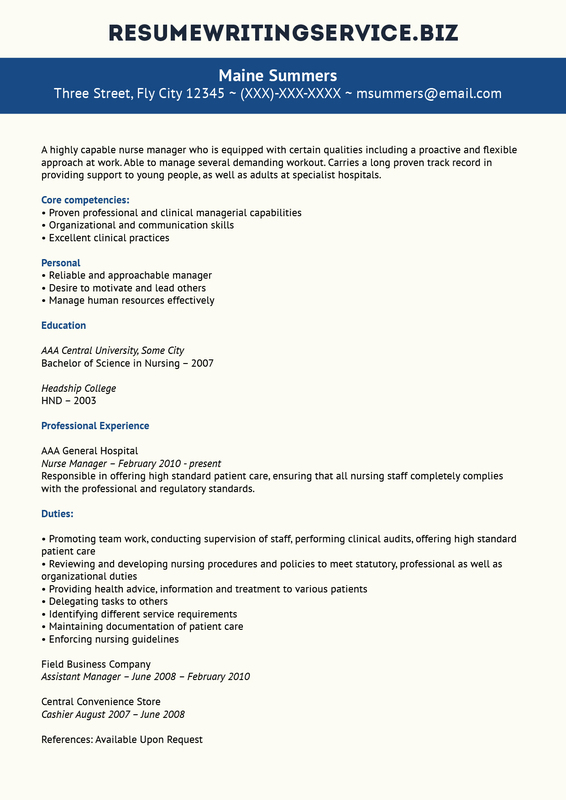 It can serve as a sort of manager nursing resume template that you can follow. Work your way through each section of your resume using the sample as a guide and the job description and criteria of the position you are targeting as a source for keywords and skills to focus on. Review this nursing assistant resume and use it as your guide! Is the resume neat with a pleasing appearance? Does the resume have a good balance of white space and text? Does the resume use bullet lists and avoid paragraphs? Does the resume highlight all of the most important information using techniques such as bold text or underlining? Is the resume written in the format that will most effectively show off your abilities? Your final proofread resume should look professional and highlight your qualifications for the position so the reader’s eyes will be drawn to them immediately. The Bureau of Labor Statistics Occupational Handbook groups Nurse Managers with other medical and health services managers, rather than separately. In the U.S. there are about 333,000 jobs in medical and health services management and the median salary is $92,810 per year or $44.62 per hour. Employment of medical and health services managers is projected to grow 17 percent over the next 10 years which is faster than the average for all occupations. We also offer you to have a look at our remarkable nursing department head resume sample to get some fresh ideas! Got questions? We can help with your nurse manager resume writing today!